Wild and Wonderful. Mountaineers are always free. 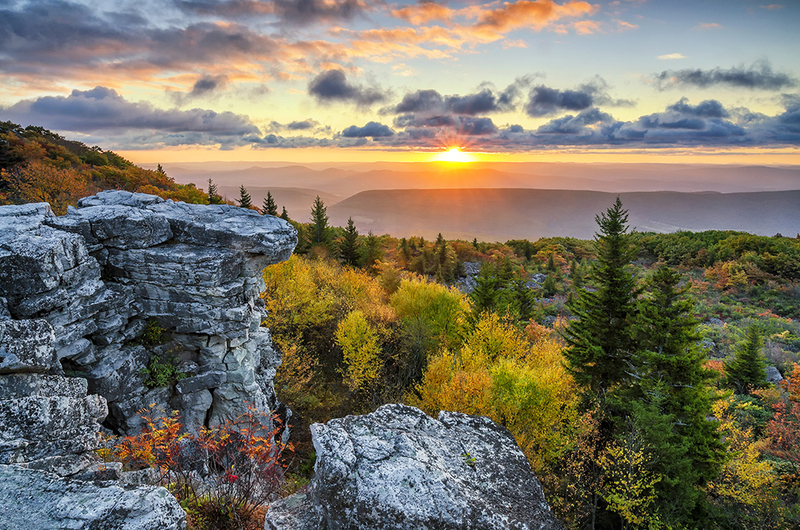 West Virginia is known as the Mountain State due to its location in the Appalachian mountains. This state was admitted into the Union in 1863, and it became a key border state during the Civil War. 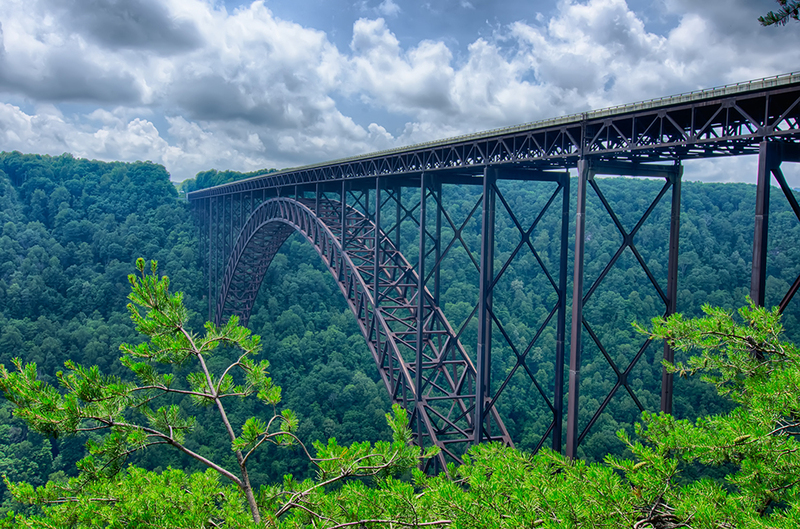 West Virginia is home to rolling hills, mountains, and its coal mining and logging industries. People from all over the world travel to this state because it is one of the most densely karstic areas in the world, and this means that it has a huge collection of cave systems that are perfect for research and recreational caving. Outdoor recreational activities also dominate West Virginia from skiing, hiking, whitewater rafting, rock climbing, hunting and more. This state is known for its diversity and its varied ways of living. The larger cities that are located in this state are thriving, but there is also a more laid-back feel to the smaller communities and the more rural areas. You have a broad range of living conditions to choose from in this state, and each one has benefits and drawbacks associated with living there. People move to West Virginia for the diverse economy and the lower cost of living. This state's annual cost of living is well below the national average, and this includes housing prices. When you combine this with the fast-growing cities, you have a combination that draws younger people looking for an affordable place to live that has several job opportunities. The close proximity to many outdoor recreational activities is another large draw for people to move to the state. However, people move out of West Virginia for several valid reasons as well. While the cities are fast-growing, you may not experience the fast pace you'd normally associate with larger cities. People leave the state to look for higher paying job opportunities as well as an overall better quality of living. West Virginia is one of the poorest states in the nation with a median household income of $44,354 in 2016. Median household incomes have not recovered from their peak prior to the Great Recession, as 2007 incomes were $48,724 in 2016 CPI-U-RS adjusted Dollars. Stagnant and persistently low wages combined with dying industries like coal have driven many people away. West Virginia is an attractive state to live in for people who are established in their careers and who know what they want. Retirees and those who work virtually online also find West Virginia attractive as the lower cost of living makes it easy for them to afford their housing and necessities on their more restricted budgets. Residents and tourists who like outdoor recreational activities also like this state as there are a wide variety of activities to choose from. Through the time period of the housing market crash, West Virginia's real estate market didn't suffer as much as the rest of the nation. The market showed its first signs of trouble at the start of 2006 with a peak and a sharp drop that leveled out and started to go upwards again at the end of 2006. This slight upwards trend continued until the first quarter of 2008 when the market plateaued slightly before beginning to fall in the second quarter of 2008. The market fell sharply through 2008 only to rebound into a peak in the first quarter of 2009. This peak dropped off until the third quarter of 2009 when it hit a plateau. This plateau lasted from the third quarter of 2009 until the fourth quarter of 2010 when it peaked. From this peak, the market dropped to its lowest point, and it hit bottom in the second quarter of 2011. Once the housing market hit its lowest point, it rebounded sharply into a small peak by the fourth quarter of 2011. This peak dropped slightly, and then the market started a steady climb until the fourth quarter of 2014 when it experienced a sharp drop. By the second quarter of 2015, it had rebounded again only to drop slightly once more before leveling off. Throughout 2016, the market continued to climb at a steady pace, and it experienced a small setback in the first quarter of 2017 before recovering quickly and continuing to climb. The market has been higher than it was before the collapse since the second quarter of 2015. However, Charleston didn't have as much luck during the housing market collapse, and it has had an extremely unstable housing market ever since it collapsed. The third quarter of 2006 market a steep drop in the housing market that saw a very quick but unsteady rebound. There was a gradual drop and rise throughout 2007 before the market dropped off. By the first quarter of 2008, the market was peaking only to suffer another short drop. This recovered quickly, and 2009 saw the market hit its highest point before starting on a very rocky descent. This descent continued with a slight peak in the first quarter of 2010, only to rapidly drop once again until it hit its lowest point in the middle of 2010. Once it hit its lowest point, the market went into a very rapid peak in the third quarter of 2010 before it fell and hit another low point at the start of 2011. The middle of 2011 saw another slight peak that fell away until the first quarter of 2012 when the market rapidly went into another peak. This peak fell away until the third quarter of 2012 when the market began to see less extreme peaks and drops. There were small peaks in the first quarter of 2013, the third quarter of 2013, and the first quarter of 2014 brought a slightly higher peak. This dropped sharply only to peak again in the third quarter of 2014. The market has continued this pattern of rapidly shifting between highs and lows into 2017, and the market prices are not much higher than they were before the housing market first collapsed between 2007 and 2008. Homeownership across the state has ranged between 72% and 81.3% over the past 33 years. From 1990 to 2004 ownership grew almost every year, jumping from 72% in 1990 to 81.3% in 2005. Since the 2005 peak ownership has generally been on a downtrend, reaching a low of 74.8% in 2016. Ownership across the state is much higher than the national average, which was recorded at 63.4% in 2016. The start of the 1990s saw West Virginia's housing market on a slight downward drop that went into a very slight peak in 1991 before dropping slightly once again. The fourth quarter of 1991 until the third quarter of 1994 brought stability to the market with a steady climb. Between the third and fourth quarter of 1994, the housing market had a slight dip that quickly evened out and resumed climbing. This steady climb continued until the second quarter of 1992 when the market hit a plateau. This plateau lasted until the end of 1996, and then West Virginia's housing market started to rise. This trend continued until 1999 when the market experienced a slight dip that stayed low until the early 2000s. The first quarter of 2001 saw the market go into a steeper climb that remained relatively unchanged until it hit a plateau at the end of 2005. This plateau went into the first peak of the housing market crash. In comparison, Charleston had a much more unsteady climb, and the start of the 1990s saw the housing market hit with several peaks and sharp drops that began to level out slightly in the middle of 1991. This continued into 1992, with the market seeing more gradual rises and falls until the start of 1994. Once 1994 came, the market went back to experiencing sharper rises and falls with peaks in the first quarter of 1994, the third quarter of 1994, and the second quarter of 1995. After the last peak in 1995, the market had a more gradual rise once again that was interrupted by a plateau that lasted from the third quarter of 1996 until the first quarter of 1997. The second quarter of 1997 brought slight stability that continued until it hit a slight plateau in 1998. Once this plateau came and went, the market went into a steep peak that dropped off quickly in throughout 1999. The start of the 2000s brought a peak that fell away only to rise to another peak at the start of 2001. This peak leveled off, and the housing market experienced another bout of stability with minor peaks and drops as it climbed from the second quarter of 2002 until the third quarter of 2004. The third quarter of 2004 saw the market rapidly hit a high peak that dropped slightly and leveled off only to rise again in the fourth quarter of 2006. This market a gradual climb into 2007 and the housing market collapse. 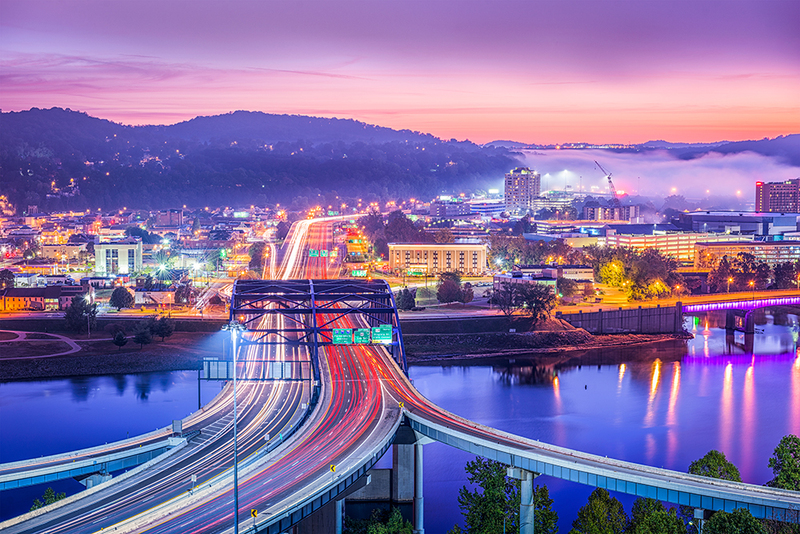 West Virginia is home to many unique and fast-growing cities that draw thousands of people to visit and live each year. The diverse economy and the low cost of living contribute to the popularity of these cities. 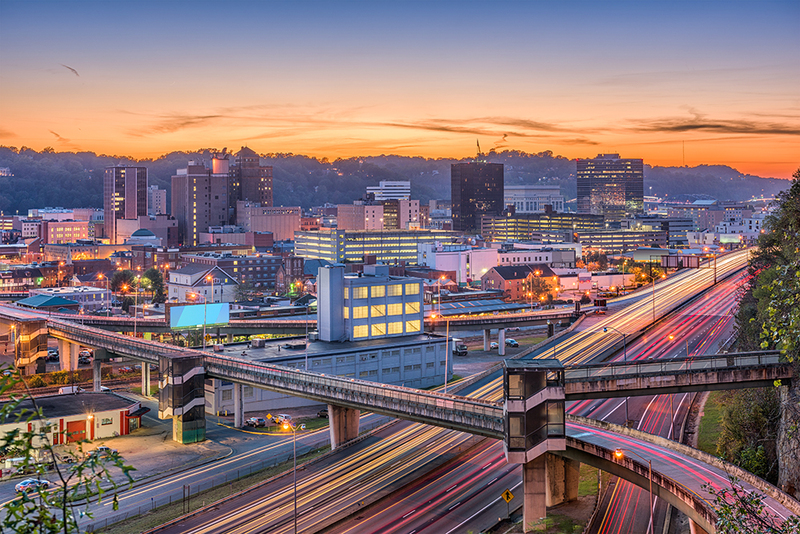 The city of Charleston is the most populous city in West Virginia, and it also serves as the state's capital city. As of 2016, Charleston had a population of 49,138 people. This city is also apart of the bigger Charleston Metro, and the combined population of the city and the Metro area are 217,916 people. In 1788, Fort Lee was the first permanent settlement was build in the place where Charleston now stands. Charleston is home to several large company headquarters. In addition to this, healthcare, education, tourism, and retail all work to support the local economy. Charleston is also part of an economic development program called the Charleston Alliance. The city has also had a long history with the natural gas and coal mining industries, and this continues to this day. This city is located between the humid continental climate and the humid subtropical climate. It still has four seasons, but they're tempered by these two climate zones. This also makes Charleston experience warmer winter temperatures than the rest of the state, and Spring brings the most unpredictable weather with temperature fluctuations up to 20 degrees in a single day. July is typically the warmest month of the year with temperatures in the high 80s. January is the coldest month of the year with temperatures in the low 20s. Charleston has several festivals and events that take place throughout the year that draw tourists and residents alike. The Avampato Discovery Museum is another point of interest that features a variety of exhibits. There are also several parks and outdoor attractions around the city including Joplin Park which has several swimming pools, tennis courts, and playgrounds. Finally, the West Virginia International Film Festival happens twice a year and it showcases local and regional films. The Kanawha County School District serves the city of Charleston, and it has over 28,000 students currently enrolled. Charleston is also home to several public and private colleges and universities like the West Virginia University. Students can also attend the private University of Charleston, which has over 1,000 students. Also, the BridgeValley Community and Technical College – South Charleston Campus is also located here. The biggest employer in Charleston is Appalachian Power, and this company has over 3,500 employees. Charleston's second-biggest employer is Charleston Area Medical Center with over 3,000 staff members. Finally, the third-biggest employer in the city is the City of Charleston with around 2,000 staff. Despite the fact that the economy is supported by several large companies and industries, the unemployment rate in Charleston is still higher than the national average. In addition to this, the economy has experienced a lack of growth over the past year, and this could attribute to the higher unemployment rate. Over the next ten years, Charleston is estimated to add over 30% more jobs to support the economy. Charleston has a local median home price of $103,400, and this works out to an average of $100 per square foot. These prices have gone up over the past year over 3.7%, and they're estimated to go up another 4.1% by the end of the coming year. The local median home price for the Charleston Metro is $164,900. Huntington is the second-biggest city in West Virginia, and it has a population of 48,113 people. Huntington is also part of the bigger Huntington-Ashton Metro area, and there is a combined population of 359,588 people. This city is home to one of the busiest inland ports in the nation, and the city is surrounded by abundant natural resources. The local economy is supported by coal, chemicals, oil, and steel. Education, healthcare, tourism, transportation, shipping, and retail also play important parts in supporting the local economy. However, the port is the main economic support, as it has been for years. This city is located in the lowest and westernmost portion of West Virginia, and this puts it right on the edge of the humid subtropical climate zone. It also allows Huntington to have four seasons each year. The Ohio River contributes to this city's higher humidity levels, and the city only sees moderate snowfall. July has temperatures in the high 80s, and January sees the coldest temperatures every year around 25 degrees. Huntington has several parks, museums, events, festivals, and points of cultural interest throughout the city. The city is also dedicated to the performing arts, and the Keith-Albee Performing Arts Center is located here. It is also home to the Tri-State Comic Con, which is the largest event in the state. Ritter Park is another attraction that draws people for its scenic walking trails. Sports are also popular in this city, and it is home to The Thundering Herd. The Wayne County School System serves this city, and it currently has over 10,000 students enrolled. Huntington is also home to several colleges and universities including Marshall University. Additionally, the Robert C. Byrd Institute for Advanced Manufacturing is located here, as well as St. Mary's Medical Center's School of Medical Imaging. Huntington has several notable employers. The biggest employer is Marshall University, with over 2,000 staff. The second and third-biggest employers come from the healthcare field, and Cabell Huntington Hospital, and St. Mary's Medical Center have 1,800 and 1,600 employees respectively. The unemployment rate in Huntington currently matches the national average, and there hasn't been any job growth in the past year. It has actually lost jobs over the past year, and this could contribute to the current unemployment rate. Over the next ten years, Huntington is estimated to experience economic growth of around 32%. Huntington has a local median home price of $105,000, and this price averages out to around $83 per square foot. Over the past year, the prices have gone up by 0.6%, and they're estimated to go up another 2.4% in the coming year. The Huntington Metro area has a local median home price of $96,700. Morgantown is the third-biggest city in West Virginia, and it is found along the Monongahela River. This city has a population of 30,855 people, and this population increases dramatically between September through May by college students. Morgantown is also part of the bigger Morgantown Metro area, and this population is 138,380 people. This city has a rich cultural history, and Morgantown was incorporated in 1863. Morgantown is home to the largest educational institution in the state, the University of West Virginia. The city is known for its "Mountains of Opportunity" for business expansion and development, and that may be part of the reason for its growth. It consistently has one of the lowest unemployment rates in the state and is in Monongalia County, the only north central county to have population growth for the past 20 years. It is also the home of actor Don Knotts and NBA legend Jerry West. The local economy is supported by the education sector and the public transportation sector. It also has strong influences from tourism, retail, service, and healthcare. All of these factors work to strengthen the local economy, and it makes for a very diverse economy. This city straddles two different climate zones, and the humid continental climate zone along with the humid subtropical climate zone influence this city. The winter months are cool to cold with January seeing temperatures in the low 20s. The summer months are hot and humid with July seeing the hottest temperatures in the high 80s. Also, the city does get moderate snowfall, but the temperatures are warmer. There are several cultural points of interest located throughout the city, and they include museums, parks, performing arts, and theaters. The Monongalia Arts Center draws hundreds of people through the city each year. If you like history, the Morgantown History Museum makes an excellent day trip and a way to immerse yourself in the city's history. You can also visit the Hazel Ruby McQuain Riverfront Park. Monongalia County Schools serves the city of Morgantown, and it has over 10,000 students enrolled. Morgantown is also home to the West Virginia University, and this college draws thousands of students to the city during the school year. It has over 31,000 students enrolled, and students can take over 190 different programs and courses through this college. There are several large employers in Morgantown, and the biggest employer in the city is the West Virginia University with 7,600 staff members. The second-biggest employer in the city is UVW Medicine, and this company employs 6,000 staff members. The employer that rounds out the top three biggest employers in the city is the Monongalia County Schools with 1,800 employees. The unemployment rate in Morgantown is the same as the national average, and the economy has also lost jobs over the past year. This can contribute to the higher unemployment rate. However, this may improve over the next ten years as Morgantown is looking to add around 31% more jobs to the local economy. Morgantown currently has a local median home price around $180,200, and this figure averages out to around $133 per square foot. These prices have actually declined over the past year by 9%. They're estimated to increase by just over 1.2% in the coming year. The Morgantown Metro area has a local median home price of $199,800. 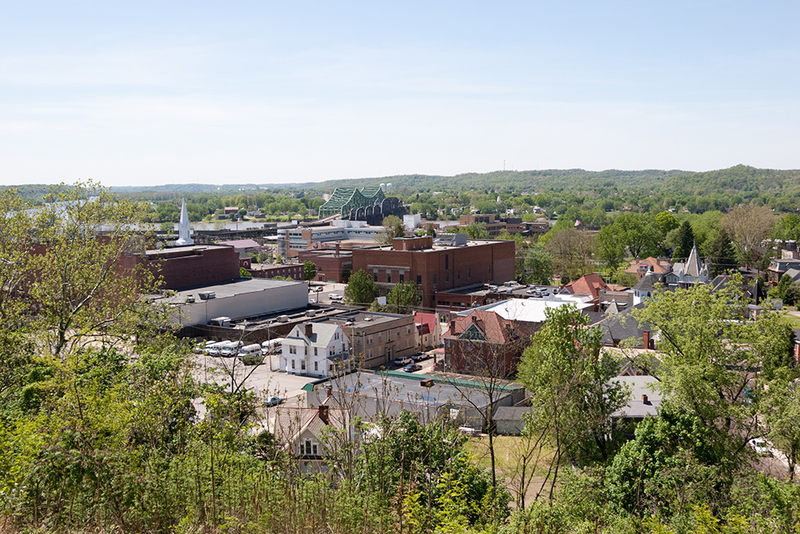 The fourth-biggest city in West Virginia is the city of Parkersburg with a population of 30,601. It is also part of the bigger Parkersburg-Vienna Metro, and the Metro area has a population of 91;449 residents. Parkersburg was an important stop for the Baltimore and Ohio Railroad, and it is home to the longest railroad bridge in the world. Parkersburg came to be in 1810, but it wasn't incorporated as a city until 1860. The transportation industry and the oil refinery industry both have strong historical ties to this city. Chemicals, steel, textiles, and iron manufacturing also make up important parts of the current economy. Finally, education, retail, tourism, and healthcare round out the top economic supports. 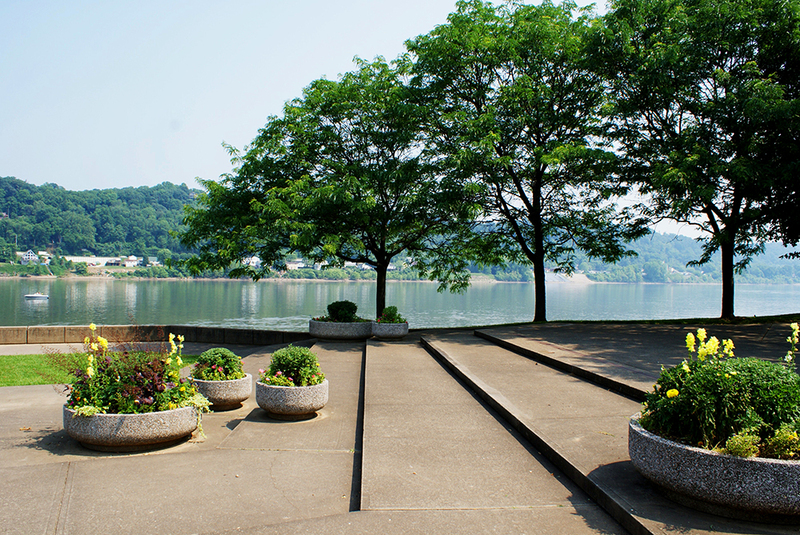 Parkersburg experiences humid, long, and hot summer months with the temperatures typically sitting in the high 80s. Residents also get high humidity year round. The winter months are very cold and windy with temperatures staying around the mid-20s. Spring and fall are cooler, and they typically have wetter weather. This city has several annual events and festivals year-round that draws hundreds of tourists through the city. There are also several cultural points of interest and historically prominent places throughout the city. The Blennerhassett Museum of Regional History is the perfect place to immerse yourself in the local history, or you can experience the local cuisine at the Taste of Parkersburg festival. There are several public and private schools located in and around the city of Parkersburg. Students can attend the two-year, private Mountain State College. The West Virginia University at Parkersburg is located on the outside of the city, or students can attend the Ohio Valley University. There are also eighteen elementary schools, five middle schools, and four high schools. Parkersburg has a diverse economy, and this is reflected in the top three biggest employers. The Camden Clark Memorial Hospital Corporation is the city's biggest employer with 3,200 staff. The second-biggest employer is United Construction Company, Inc, and it has 2,500 staff members. The third-biggest employer in Parkersburg is the Treasury Franchise Fund with 2,000 employees. This city has an unemployment rate that is 1.6% higher than the current national average. It has also lost jobs over the past year, and this could be a contributing factor to the unemployment rate. However, over the next decade, Parkersburg is estimating on adding 31% more jobs. Population across the state of West Virginia peaked at 2,005,552 in 1950 and fell to 1,852,994 by 2010. Declining populations are generally bad for economic growth, however a declining population also means less real estate demand, which in turn can help lower real estate prices. A person looking for a low cost of living or a family which is retired will find highly affordable living options across the state. Most of the cities across the state have seen population declines since 2010. The state has lost nearly 40,000 residents since the 2010 Census and is expected to lose another 19,000 residents by 2030 as death rates exceed birth rates & the state also has a net out-migration. The state's population as of 2016 is 1,831,102. Outside of Morgantown one of the few cities which has seen recent growth is Martinsburg. Part of the reason for the growth may be the major companies, such as General Motors and FedEx that are in the city. The IRS also has a facility, which processes tax documents for the county, in the town. According to the United States Census an estimated 1,831,102 people live in the state of West Virginia. The state has 24,038.21 mi² of land area, which gave it a population density of 76.17 per mi². Here is a list of cities, towns, villages & Census Designated Places across the state along with their estimated population as of June 2016 & the 2010 United States Census. For areas with fewer than 5,000 residents & Census Designated Places (CDP) where there was no population estimate available for 2016, the 2011-2015 American Community Survey 5-Year Estimates data was used. West Virginia conforming mortgages were established to make it easier for low and middle class families to receive home financing. Fannie Mae and Freddie Mac securitize the loans to drive down costs, and the Federal Government provides backing of the government sponsored entities (GSEs). As of 2019 the conforming loan limit across the United States is set to $484,350, with a ceiling of 150% that amount in areas where median home values are higher. High local affordability makes the $484,350 ceiling apply across most of the state for single unit homes. Dual unit homes have a limit of $620,200, triple unit homes have a limit of $749,650 & quadruple unit homes have a limit of $931,600. People buying properties in the suburban area of Washington D.C. have higher conforming mortgage thresholds. Several different types of home loans are available in the Mountain State. Fixed-rate loans are very common, and the terms include thirty, twenty, fifteen, and ten years. The longer the life of the mortgage, the lower the monthly payment will be, which is why the 30-year loan is the most popular. The downside of this, however, is that the APR is higher compared to shorter-term loans. The difference can be as large as a full percentage point. The West Virginia Homeownership Program allows prospective homeowners to be able to afford a mortgage better. Borrowers may also be eligible for down payment and closing cost assistance as well as a mortgage loan with lower interest rates. To be eligible, applicants must have an income that is below the county limit, the property must not exceed the housing price limit, and applicants must plan to have a primary interest in the property they purchase with the program's funding. This program's funding comes in the form of a mortgage that is fixed-rate and comes in 30-year terms. Applicants are allowed to finance up to 100% of their home's purchase price with the mortgage. If an applicant qualifies for the Homeownership program, they may be eligible for the closing cost or down payment assistance program as well. If they are, they'll get up to $7,500 if their loan has a loan-to-value ratio that is greater than 90% of the property's purchase price. If the homebuyer has a loan-to-value ratio that is less than 90% of the property's purchase price, they'll be eligible for up to $10,000 in funding. This funding comes in the form of a fixed-rate loan that has interest rates way below the current market rate. As of 2017, the current interest rate on this loan for this program is 2%. Applicants can choose to use this funding for closing costs and its associated fees, or for a down payment on their home. The Moving Up Loan Program was designed to help moderate-income home buyers afford to buy a larger home. This program is different as it isn't geared toward just first-time homebuyers, and almost anyone is eligible. The applicants will have to meet some limits and requirements to be considered eligible for this program. They have to have an annual income that is at or below $113,760 for a one to a two-person household, or they have to have $132,720 or below for a household of three or more people. Also, the homebuyer must purchase a home in West Virginia, and the home must be either a single-family home, condo, manufactured home, or a townhome. Applicants must also complete a homebuyer education course before they get funding. They'll also be eligible for down payment and closing cost assistance as well. West Virginia has a very low risk of earthquakes or tornadoes. Most of the state has a low to very low risk of hail. The following counties have a moderate risk of hail: Berkeley, Jefferson, Lewis, Morgan & Wood. Most counties across the state have a very low risk of wildfires. Boone, Mingo & Raleigh have a low risk while Lincoln & Monroe have a moderate risk. Most of the state of West Virginia has a relatively elevated flooding risk when compared against other states. Here are counties across the state which have a flooding risk profile above very low. Typically, homes built after 2002, when building code regulations tightened, are subject to lower insurance rates than older homes. On the other hand, homes with roofs that do not meet current standards for wind, with older plumbing or with outdated electrical systems may be difficult  or very expensive  to insure. Most of West Virginia has a very low earthquake risk, while the southern edge of the state has a low earthquake risk. Standard rental and homeowner insurance policies typically do not cover earthquake damage, though they usually cover losses caused by fires which resulted from an earthquake. You can supplement your homeowner's insurance with an earthquake policy. West Virginia has the sixth-lowest property tax rate in the nation. In 2016 the average assessment was 0.57% in the state compared to a national average of 1.24%. The current property tax rate averages out to be $464 per year for a home that costs $94,000. This rate is around 1.03% of the homeowner's annual income. Each county has different property taxes, and Jefferson County has West Virginia's highest property tax rate at $1,379 per year. The county with the lowest property tax rate in West Virginia is Webster County with an annual rate of $235 per household. Single family homes have a median price of $271,585 across the state, which leads to an average assessment of $802. In the event a homeowner faces financial hardship and has to declare bankruptcy, these laws allow the homeowner to protect part of their property from creditors who would take it to satisfy their debts. West Virginia has a slightly lower rate than a homeowner can claim under the Homestead Law. Currently, homeowners can claim up to $5,000 in real estate and an additional $1,000 in personal property. Once a property owner claims this, this property is safe from creditors. The state of West Virginia allows for judicial and nonjudicial foreclosures. However, most mortgage lenders choose to go through the nonjudicial foreclosure process because it is a quicker process than going through the court system. West Virginia is also a recourse state, and this means that the mortgage lender can sue the defaulted borrower if there is a deficiency once the property sells at a foreclosure sale. A deficiency almost always occurs with a foreclosure sale, and this means that the property in question sells for less than the borrower owed. If a borrower owed $120,000 on a property and it sold at a foreclosure sale for $80,000, there would be a deficiency of $40,000. The lender can then sue the defaulted borrower for the deficient $40,000. Depending on which foreclosure process the lender chooses to use, the deficiency judgment is handled in slightly different ways. If the lender chooses to have a judicial foreclosure, the deficiency lawsuit must be included in the original foreclosure lawsuit. If the mortgage lender chooses to have a nonjudicial foreclosure, the mortgage lender can sue the defaulted borrower once the foreclosure process is completed. Whichever way the mortgage lender chooses to go about their foreclosure process, the defaulted borrower could find their bank accounts levied and their wages garnished to satisfy the deficiency. In West Virginia, a home buyer does not have the right of redemption if he goes through foreclosure. That is the right to buy his house back from the one who bought the house at foreclosure. A home owner who goes through foreclosure has the right to reinstate his loan by bringing it current and paying all expenses, fees, and late charges. A ten day notice must be given. Once you do so, you can continue to make payments as though you were never in default. If you are ever behind on your payments again, the lender will have to start foreclosure proceedings all over again. If a notice to default is served three or more times, however, there is no longer a right to reinstate. Visit the following resources to learn more about the West Virginia real estate market.